A few of the posts on this site have been getting a lot of attention from people in Arkansas lately and the Special Operations community, the ones about the young paratrooper who fell out of the sky into Dayton and immediately set up a “non-profit” – “Citizens 4 Change,” to save us from ourselves. His ties to Dayton were, from memory, because a girlfriend’s family was from here- but, it really didn’t matter, because the guy we knew as Kenneth Wade or Kenneth Wade A, is now the Democratic Congressional candidate in Arkansas district 3- running against a Republican incumbent in a Republican District– and making a royal mess of it. When he pulled up stakes in Dayton, he went to West Memphis, Arkansas, and started with the non-profit thing again- this time as “Residents 4 Arkansas” which lasted about a heartbeat and a half, before he moved across the state to Russellville and decided to run for Congress, now known as Kenneth Aden. Ken Wade Aden in uniform, no Special Forces Tab- but, we’re looking at the wrong sleeve. The mess seems to be that little Kenneth (I say this because of his physical size and his behavior) seems to have a problem with telling the truth. While in Dayton, he never mentioned Special Forces as part of his military service. I knew him as a paratrooper with the 82nd who had served in Iraq. His bio, that I had posted here– from his early congressional site said nothing of SF. But apparently, that wasn’t enough of a military record for Ken- he decided to start telling people he had completed the Q course and was SF qualified- although in his picture in uniform- he doesn’t display the SPECIAL FORCES tab- that’s been the standard since I got out. Personal note- full disclosure: Just like Ken, I went to the Q Course and for personal reasons, I self-selected out 2 days before the completion of Phase 1- I wasn’t sent to the 82nd- but instead was given orders to serve first with Service Company, 5th Special Forces, and then to Service Company, 7th Special Forces- ostensibly until I would go back through the course. I was a radio operator, 05B, with the 1A4 designator for Morse code, and a paratrooper. At that time, radio operators who could master the dots and dashes were in short supply. I was separated from the Army on Temporary Disability Retirement Leave (TDRL) after an injury that was made worse by poor military medical care (The one time I was proud of the Dayton Daily News was when they did the exposé of military medicine and won the Pulitzer– I could have been a case study), came to Dayton to enroll at Wright State under VA chapter 31 benefits. 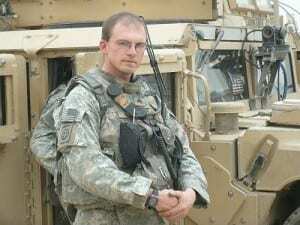 After 18 months, I was re-evaluated medically, deemed fit for service- given options to return to active duty, separate or enter the Reserves- which was the choice I made. I was assigned to the 11th Special Forces (Reserve) in Jamestown- where I was placed on an A-team as the secondary radio operator- still not having completed the Q-course. My last quarter of college, due to the demands of work, school and Reserve duty- I separated from the 11th group and never received other orders. My only permanent party duty was served in an SF unit through my entire military career- I have never worn any other patch. Therefore I’ve always said I served with Special Forces- not in it, and have been through enough training to fully understand and respect the mission and to speak with authority on the subject. Maybe it was because Ken knew his BS wouldn’t fly with me, it never came up in Dayton, but, as it’s been unfolding in Arkansas, the Democrats are now stuck with a candidate suffering from self-inflicted stupidity. His campaign will unlikely raise another dollar, nor will voters take much of what he says seriously. He’s also being accused of embellishing his academic achievements- with claims of degrees and post-grad work that seem hard to verify. However, Ken, as the eternal optimist that he is, is still going around telling people the sky is green and grass is blue- and that this is all an attempt by the incumbent to “swift boat” him. Last week, his campaign manager quit. And to top it all off, the Army has taken the initiative to issue new orders rescinding what may have been a doctored DD-214 or a clerical error, that had shown Ken as 18B qualified (after I left active duty- the Army changed the SF Q qualification from a designator on your Military Occupational Specialty (MOS) to an actual MOS- the 18 series- when I was on active duty I would have been a 05B1a4PK (or something like that- it’s been 25 years I’m sorry if I don’t remember the exact way it breaks) but now I’d have been an 18E). Even Aden’s former platoon sergeant pulled a recommendation letter he had submitted in favor of Ken- saying he’d been duped by our con man. Aden is still not doing the honorable thing and resigning from the campaign to give the people of Arkansas a chance to run someone else. He’s announced an online town hall for July 11th to clarify matters. Many veterans are blaming the Supreme Court for dropping the “Stolen Valor” laws against lying about military records– but, if there is one thing I can say about the military- they do keep records- and there are very few things you do solo in the military that can’t be verified that are worth talking about. From my experience, it was even hard to poop in private on most occasions. Lying about your military service almost never works. The sad thing about all this is that once again, the voters are the ones who get robbed. For a democracy, where the ballot is supposed to give us an opportunity to make changes in leadership and change the course of our nation, very rarely do we feel we’re given choices among the best of what America has to offer. There is the issue of getting on the ballot, where the two major political parties have monopolized the process and served as gatekeepers to keep people off the ballot. There is the issue of costs to communicate your positions- with the average cost of running for Congress over a million dollars and climbing. We’ve allowed gerrymandering to decide more elections than voters and last but not least, you either have to be an empty suit or a glutton for punishment to put your life under the microscope of public opinion and the political dirty-tricks squads. We’ve almost engineered a system for sociopaths or megalomaniacs to be the only ones willing to run. Kenneth Wade or Kenneth Aden isn’t the only questionable person out there. I’ve had to tell a former county employee/school board member not to lie about serving with Special Forces right here in Dayton. We’ve had the local Interdenominational Ministerial Alliance running around behind Rev. Raleigh Trammell for years bullying local politicians and engaging in the joining of church and state (despite their non-profit status) – and finally, it took the FBI to come in and shut down Reverend Trammell for welfare fraud (something he’d already served time for in the late 70’s) only after he practically destroyed the SCLC. Seriously, who vets the people we elect? Voters aren’t given enough information to even make an informed decision on the ones who make it on the ballot. We do background checks on teachers, police officers and even little league coaches. We probably should be doing it on most preachers from the history of the Catholic Church and abuse. Shouldn’t we start requiring it of candidates for office? I’ve had a guy cut my hair who served 18 years for murder who I think I’d trust more than Mike Turner to do the right thing for the people as a congressman. But, he can’t run for Congress- it’s one of the few things that disqualifies you from running. Kenneth Wade Aden may be a liar, but, as long as we continue to auction off seats in Congress- we’ve got a House full of them. My advice to the people of Arkansas 3- tell him to stop campaigning and don’t give him another dime, but go ahead and vote for him and send him to D.C.- where he’ll either fit right in- or actually make the rest of them so nervous that things may actually change. Wade/Aden is already on the list. I don’t really view Turner’s picture in front of an Air Force plane as indicative of claiming he served in the military, that simple fact could be gleaned from his bio. That said, whether SCOTUS thinks lying about your military service (or lack of it) is protected speech under the 1st amendment, these jackasses who try to embellish their “resume” with lies piss me off. Myself, I was a simple Airborne qualified 81MM & 4.2″ mortarman, eventually advancing to be a Spec-5 crew leader, as I couldn’t claim the title of squad leader because I wasn’t a “hard stripe” E-5. I never attended NCO School. You said succinctly what we’ve been trying to express in black and white for awhile now. Your personal experience lends much credence to the position we’ve been forced to explain over and over. The squeaky wheel won. Be sure and find the intro thread for 1st timers. RB- thanks for the comment. I’m not sure I belong on Professional Soldiers- it’s been almost 25 years since I wore a uniform- and it’s not something I wear on my sleeve these days. I am active in a group I helped start called http://www.vob108.org where we try to help vets start businesses and work together to grow our own businesses. I invited Ken to a meeting on more than one occasion, he never came. @Pat- I agree that posers piss me off. By the time I was in- the only spec 5-7 were in medical, with the lowly Spec 4 still a possibility. In my MOS – that was my final rank. I always hated it. Thank you for your service. Us paratroopers should always stick together. RUSSELLVILLE—Ken Aden, Democratic Candidate for U.S. Congress from Arkansas’ Third Congressional District, on Monday morning announced his intent to withdraw from the race for United States Congress effective at 5 p.m. on Monday, July 9, 2012. “Mr. Aden’s campaign has, via overnight mail, submitted the necessary notification prescribed by the Arkansas Code to withdraw from the race for U.S. Congress. A copy of this notification has been provided to the Democratic Party of Arkansas as well,” said Vince Leibowitz, spokesperson for the campaign. Aden said he was exiting the race in order to spend more time with his family and to help ensure victory for Democrats across the state in November. “Unfortunately, the ongoing saga related to my military records has created a tremendous distraction for our campaign, and I did not want this to have adverse consequences for Democrats across the district or anywhere else in the state,” Aden said. “Additionally, as most of you know, I recently became a father for the first time, and I will be exiting this race in order to spend more time with my family,” he continued. “I sincerely regret any difficulty that this situation has caused my fellow Democrats, my supporters, and staff. I will continue to remain a loyal Democrat and to my best to help Democrats in win in November,” he concluded. ADDITIONAL INFORMATION: Copy of Mr. Aden’s letter to Arkansas Secretary of State notifying the SOS of his withdrawal. A copy of the same has been transmitted to the Democratic Party of Arkansas. Arkansas’s Third Congressional District includes Benton, Carroll, Washington, Pope, Marion, and Boone counties, and parts of Search, Crawford, Sebastian, and Newton Counties. He’s not an 18B- the Army even cut orders last week saying he wasn’t. I suspect you call him delusional in a somewhat facetious manner, but he may very well be just that ! We all know people like him, don’t we ? You know, the type that believes if you repeat a lie “x” number of times, it eventually becomes true. Well, at least *they* think it’s true as they’ve certainly convinced themselves of it !! What I’m even more confused about is how someone can move to an entirely new state and generate enough support to run for Congress (not local council, not state congress, but Federal !) and actually seem to be a “contender”. Your belated martial mea culpa in only honest by virtue of an omission of certain inconvenient facts. Jacque Derrida couldn’t have done a better job of semantic brinkmanship. So please stop wrapping yourself in a red, white & blue shroud, and kindly cover your stigmata. P.S. : You seem to have been what in army parlance is called a “commo maggot”. You call him “delusional” but he may simply be the type of person who tells so many stories (i.e. “lies”) that eventually they believe the lies themselves ! What I want to know is how he was able to develop a reasonable following and gain as much support as he did in such a short time. Not to mention the fact that he was a newcomer to the Arkansas community. It is an Arkansas story after all…. Just because Ken was in Dayton for a short period of time doesn’t mean te DDN should care. We used to have two large papers in Arkansas: The Arkansas Democrat and the Arkansas Gazette. About 20 years ago the Gazette tanked and the Democrat bought all its assets. So that’s why you have the Arkansas Democrat-Gazette. There are much longer stories that go along with that merge but it’s not unheard of when it comes to hyphenated names of papers. The Democrat tended to lean to the right and the Gazette tended to lean to the left. A bunch of the Gazette people went on to make the Arkansas Times into a weekly, but now they’re all owned by the same company. Such is the way of the newspaper. Meanwhile, here in the third district, Aden’s camp wants to sweep everything under the rug. “Move on,” they say, as if nothing ever happened or that he doesn’t have to explain himself to anyone – no matter how much money they gave him.